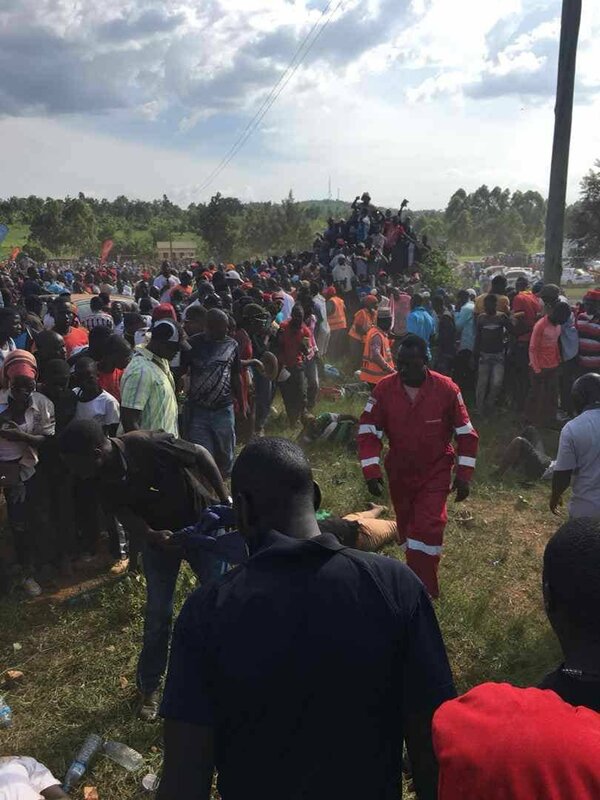 BUSIIKA- Police has Sunday evening confirmed dead and nine others injured after a rally car lost control and rammed into a crowd at Busiika Motor Sports Arena, in Luweero district. Police say the accident occurred during a motor rally event dubbed ‘Kiggwa Kw’olwo on Sunday evening. Paul Kangave, the Savannah Regional Police Spokesperson, had earlier said that all the ten sustained Multiple injuries with no deaths recorded. However, according to a new statement released by Police indicates that one of the injured died later. According to police, the rally driver was trying to save a thief who snatched a phone from one of the bystanders. Mr Kangave said those in critical conditions were rushed to Mulago National Referral Hospital and Nsambya Hospital and those with minor injuries were taken to the nearby Health Centres. A number of photos and videos shared on several social media outlets show how a number of spectators were left stricken following the crash with some trying to offer first aid to the injured. Over 30 drivers had converged at Uganda Sports Arena, Busiika for the sprint whose aim was to fundraise for rally driver Ponsiano Lwakataka to acquire a new Subaru N12B for next season.